A young widow is romanced by a sales clerk whom she inadvertently got fired. Jefferson Jones: [telling Liz that he isn't engaged anymore] She married my shipmate. Jefferson Jones: I'm as free as a bird! Elizabeth Lane: Oh, that's what you think. 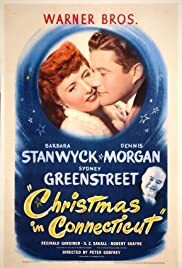 Anyone who has watched the recent remake of 'Christmas in Connecticut' will fully appreciate just how wonderful the slim story was in the hands of Barbara Stanwyck, Dennis Morgan and Sydney Greenstreet. No masterpiece, but so much better than the weak remake. The whole film revolves around the mistaken belief by editor Greenstreet that Stanwyck (his favorite Martha Stewart-type of writer) is a homemaker with a house, husband and baby in the country. This, of course, means that the inventive woman has to enlist the aid of others to play out her scheme when Greenstreet invites himself and a ship-wrecked sailor (Dennis Morgan) for the holiday week-end. The slight comedy develops a few complications along the way--and it all looks very holidayish with the lovely country home in Connecticut--which, thanks to Warner Bros. art decoration, looks like something from a magazine cover. Stanwyck's forte is really heavy drama but here she displays a light enough touch to make her scenes with Morgan and Greenstreet delightful to watch. She gets great support from Una O'Connor, S.Z. Sakall and Reginald Gardiner under Peter Godfrey's light-hearted direction. It's as unpretentious a confection as a child's homemade Christmas card and just as charming--light and fluffy entertainment that makes no great demands on your viewing pleasure. Worth viewing, especially around the holidays.